How would you convince seven shipwrecked individuals on a deserted island to buy your book? If Rhett Butler, one of the characters from Gone With the Wind were to change his famous line from “Frankly, My Dear I don’t give a damn” to Frankly, My Dear I think you should read this paragraph from this bestselling novelist. What paragraph do you think he is referring to? 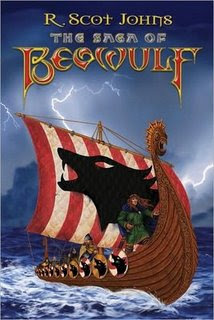 Find out all this and more today when The Real Hollywood Book Chat welcomes author R. Scot Johns author of Beowulf, a heroic fantasy novel. It is my pleasure to have you appear on The Real Hollywood blog. Let’s start with our trivia questions and see how much fun you can have. R. Scot: Great! We’re stranded! Way to go, Gilligan. At least we’ve got my novel to read. That should keep us busy for awhile. Except for the Professor, since he’s already read it twice. Now the rest of you can catch up! Skipper, you should love this story, with its sinking Viking ships and raging ocean storms! MaryAnn will love the tragic romance and Ginger, you could practice lines by reading the parts of the many strong and seductive female leads. Mr. & Mrs. Howell might like to invest in this epic action thriller which is sure to be a major hit in Hollywood! Or maybe you’ll just like to read of all the gold and jewels the Norsemen threw around, or the golden hoard the Dragon guards. Gilligan will like the comic roles of Groot and Snorri, or the ever-hopeful Otto with his dreams of owning pigs and sheep. There’s a little something here for each of you, but only this one copy, so you’ll have to share! R. Scot: Ongentheow. Just look at all those letters! And who ever chooses “w” anyway? Besides, they would have to have read my book to know the answer, so if they got it they would deserve to win. “Then believe in me,” he said, drawing her to him with his determination. This passage speaks to what Rhett Butler tried so often to express to Scarlet, of their mutual attraction even when they disagreed. Perhaps this is another way Rhett tries to get Scarlet to see his side, while still expressing his love for her. In the novel this scene occurs as Beowulf prepares to battle the fire-breathing dragon that has ravaged the land. The weight of his responsibility weighs heavy on them both, and she would have him stay while knowing he must go. R. Scot: Right next to Dickens! Awesome. First I’d like to say that it’s an honor to become a part of someone’s life, if only for a week or a day. Writing is a shared experience, from the mind of the author to the reader’s heart. I am greatly thankful to every one of you who read my work and pleased beyond belief that it somehow spoke to you. Thanks to all who bore with me through the long and arduous process that often made me insufferable to live with. I’d like to thank my landlord for not evicting me, and my boss for not firing me! Thanks to everyone who gave me needed inspiration, and most of all thank goodness I finally finished it! Thank you, Scot, for being a guest at The Real Hollywood blog today. I wish you continued success on your virtual book tour and who knows your book might just make it to the silver screen. Hello and welcome to Hollywood Trivia. This was quite a fun "interview" to do. Generally with interviews you get the standard questions as to how you came to write your book and what the process was like to get it into print, but not here! This was something entirely unexpected. So I hope you all enjoyed it as much as I. Feel free to shoot me any other peculiar questions you might have and I'll see if I can't answer. Cheers! LOL, this was fun. Thanks for hosting Scot today, Becky! This looks a real fun interview, and I agree a lot of places you get the standard questions, so it makes such a change to have something so different and enjoyable. Hey there Storyheart, good to hear from you! I certainly don't mind the "standard" queue of questions - it's always enjoyable to discuss your own work! - but it's particularly entertaining to get a seemingly random set from out of left field. It makes you stop and rethink what you've been saying, which I suppose is the whole point. Anyway, I hope it was as fun for you as it was for me. Thanks to Scot for his great answers to Hollywood Trivia Questions and for all the commenters who stopped by.